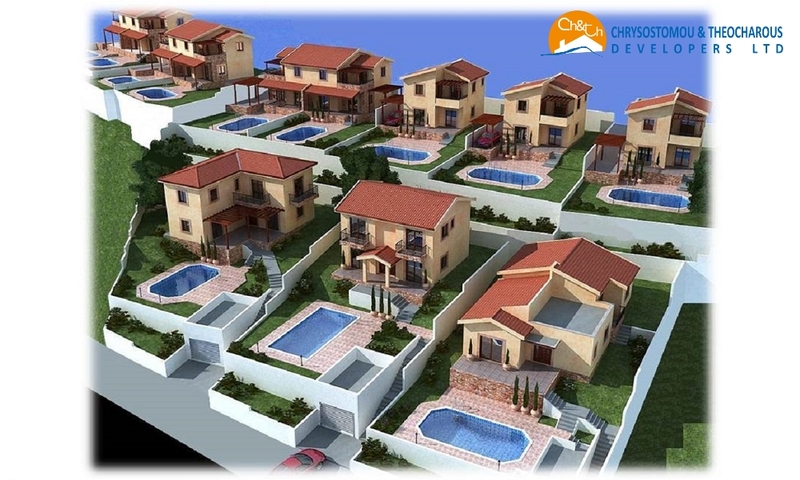 This is a project proposal for the construction of a superior mid range properties on a parcel of land situated at Meladia in Polis Chrysochous Region, Pafos. The project has been conceived, designed and will be implemented by Charis Theocharous & Accociates, Civil Engineers and Architects. The project is built on a 23000 m² land. 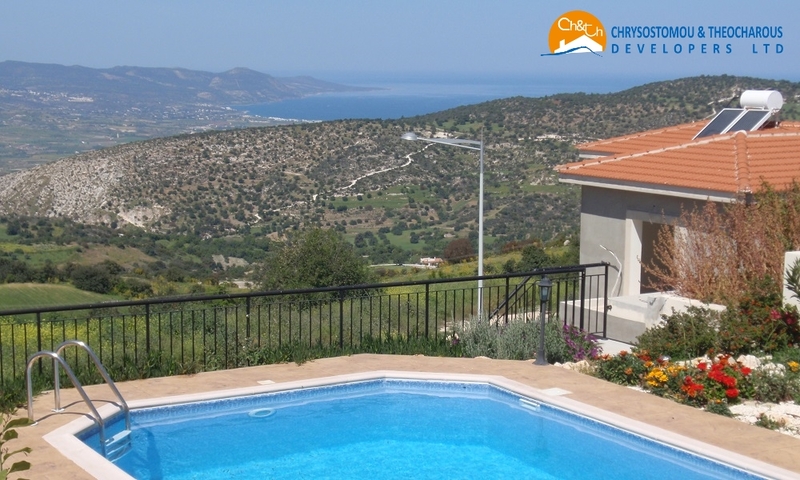 Set on the slope of the Meladia Hills it enjoys magnificent, panoramic, unobstructed, sea views as well as views to the nearby forest. This is a quality development situated at the unspoilt region of Meladia. Meladia is a very picturesque village, near Polis Chrysochous, less than 15 minutes drive from Polis centre and Latsi beaches. 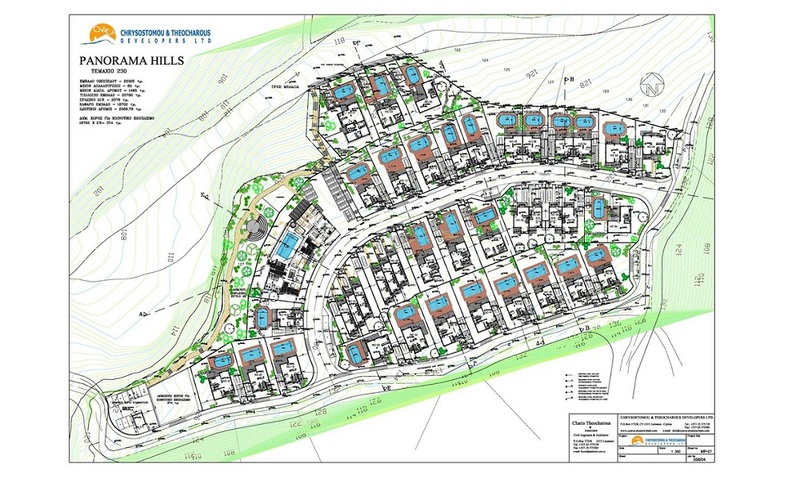 The village of Meladia, in which the construction project ”PANORAMA HILLS” has been designed, has regular coach routes connecting it to the neighboring villages of Lysos, Filousa, Peristerona and Steni, plus excellent road connections to Polis and Paphos. 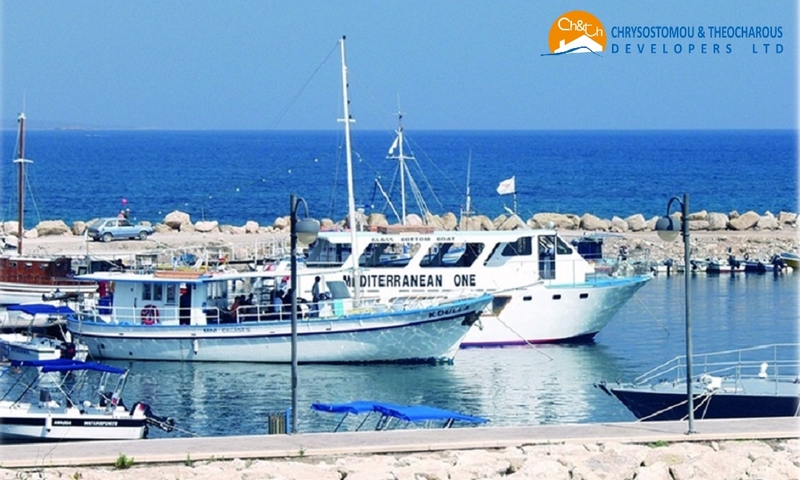 Therefore the commute to the commercial and shopping centers of Paphos and Polis can be achieved without using personal car. ‘’PANORAMA HILLS’’ it is a well designed quality project offering well built properties at affordable prices. This is a private complex in a peaceful setting, ideal for either retirement or holiday retreat. After appropriate studies, preparations of architectural plans and submission to Department of Building and Housing as well as other services, the company has secured the Planning Permit for this project. Villa No1: Detached 3 Bedrooms Villa consists of two floors (Split level). The ground floor includes living room, dining room, kitchen, guest’s WC, covered parking place, covered and uncovered verandas. The first floor has en-suite master bedroom, family bathroom and two bedrooms, one of them with uncovered balcony. Security/burglar alarm system, entrance door with video intercom facility and private swimming pool are included in the price. Provisions for central heating, air-conditioning and satellite reception are also included in the price. 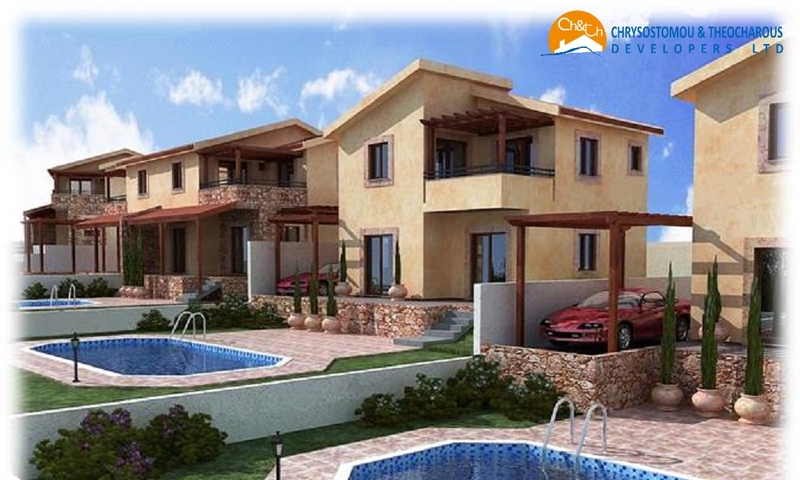 Villa No2: Detached 3 Bedroom Villa consists of two floors. The ground floor includes living room, dining room, kitchen, guest’s WC, covered parking place, covered and uncovered verandas. On the first floor en-suite master bedroom, family bathroom and two bedrooms, both with uncovered balconies. Security/burglar alarm system, entrance door with video intercom facility and private swimming pool are included in the price. Provisions for central heating, air-conditioning, satellite reception are included in the price. 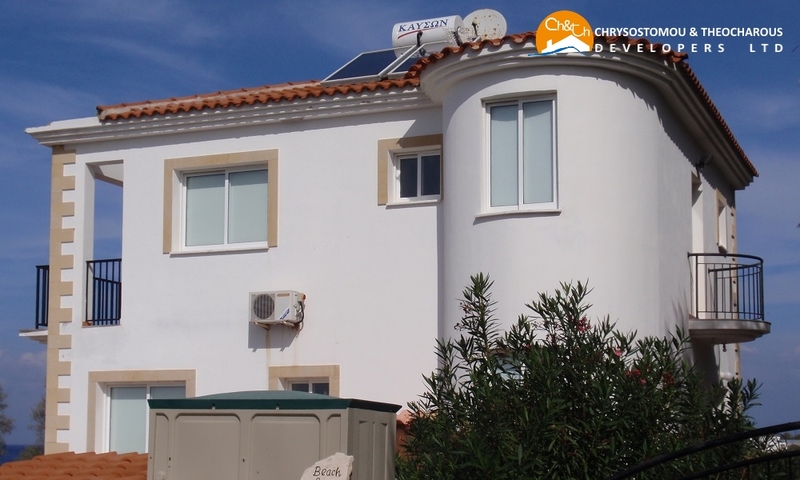 Villa No3: Detached 3 Bedroom ‘’L’’ shape Villa consists of two floors. The ground floor includes living room, dining room, kitchen, guest’s WC, covered parking place, covered and uncovered verandas. On the first floor, en-suite master bedroom with uncovered balconies, family bathroom and two bedrooms. Security/burglar alarm system, entrance door with video intercom facility and private swimming pool are included in the price. Provisions for central heating, air-conditioning and satellite reception are included in the price. Villa No4: Detached 3 Bedroom Villa consists of two floors. The ground floor includes living room, dining room, kitchen, guest’s WC, uncovered parking place, covered and uncovered verandas. The first floor has en-suite master bedroom with uncovered balcony, family bathroom, and two bedrooms. Security/burglar alarm system and entrance door with video intercom facility are included in the price. Provisions for central heating, air-conditioning and satellite reception are also included in the price. Villa No5: Detached 3 Bedroom Villa consists of two floors. The ground floor includes living room, dining room, kitchen, guest’s WC, uncovered parking place, covered and uncovered verandas. The first floor has en-suite master bedroom with uncovered balconies, family bathroom and two bedrooms. Security/burglar alarm system, entrance door with video intercom facility and private swimming pool are included in the price. Provisions for central heating, air-conditioning and satellite reception are also included in the price. Villa No6: Semidetached 2 Bedroom Villa consists of two floors. The ground floor includes living room, dining room, kitchen, guest’s WC, uncovered parking place, covered and uncovered verandas. The first floor has en-suite two bedrooms with uncovered balconies. Security/burglar alarm system, entrance door with video intercom facility and private swimming pool are included in the price. Provisions for central heating, air-conditioning and satellite reception are also included in the price. Villa No7: Semi-detached 2 Bedroom Villa consists of two floors. The ground floor includes living room, dining room, kitchen, guest’s WC, uncovered parking place, covered and uncovered verandas. The first floor has en-suite two bedrooms with uncovered balconies. Security/burglar alarm system, entrance door with video intercom facility and private swimming pool are included in the price. Provisions for central heating, air-conditioning and satellite reception are also included in the price. Villa No8: Semi-detached 2 Bedroom Villa consists of two floors. The ground floor includes living room, dining room, kitchen, guest’s WC, uncovered parking place, covered and uncovered verandas. The first floor has en-suite two bedrooms with uncovered balconies. Security/burglar alarm system, entrance door with video intercom facility and private swimming pool are included in the price. Provisions for central heating, air-conditioning and satellite reception are also included in the price. Villa No9: Semi-detached 2 Bedroom Villa consists of two floors. The ground floor includes living room, dining room, kitchen, guest’s WC, uncovered parking place, covered and uncovered verandas. The first floor has en-suite two bedrooms with uncovered balconies. Security/burglar alarm system, entrance door with video intercom facility and private swimming pool are included in the price. Provisions for central heating, air-conditioning and satellite reception are also included in the price. Villa No10: Semi-detached 2 Bedroom Villa consists of two floors. The ground floor includes living room, dining room, kitchen, guest’s WC, uncovered parking place, covered and uncovered verandas. The first floor has en-suite two bedrooms with uncovered balconies. Security/burglar alarm system, entrance door with video intercom facility and private swimming pool are included in the price. Provisions for central heating, air-conditioning and satellite reception are also included in the price. Villa No11: Semi-detached 2 Bedrooms Villa consists of two floors. The ground floor includes living room, dining room, kitchen, guest’s WC, uncovered parking place, covered and uncovered verandas. The first floor has en-suite two bedrooms with uncovered balconies. Security/burglar alarm system, entrance door with video intercom facility and private swimming pool are included in the price. Provisions for central heating, air-conditioning and satellite reception are also included in the price. Villa No12: Detached 2 Bedroom Villa consists of two floors. The ground floor includes living room, dining room, kitchen, guest’s WC, uncovered parking place, covered and uncovered verandas. The first floor has en-suite two bedrooms with uncovered balconies. Security/burglar alarm system, entrance door with video intercom facility and private swimming pool are included in the price. Provisions for central heating, air-conditioning and satellite reception are included in the price. and private swimming pool are included in the price. Provisions for central heating, air-conditioning and satellite reception are included in the price. Villa No14: Detached 2 Bedroom Villa consists of two floors. The ground floor includes living room, dining room, kitchen, guest’s WC, uncovered parking place, covered and uncovered verandas. The first floor has en-suite two bedrooms with uncovered balconies. Security/burglar alarm system, entrance door with video intercom facility and private swimming pool are included in the price. Provisions for central heating, air-conditioning and satellite reception are included in the price. Villa No18: Detached 2 Bedroom Villa consists of two floors. The ground floor includes living room, dining room, kitchen, guest’s WC, uncovered parking place, covered and uncovered verandas. The first floor has en-suite two bedrooms with uncovered balconies. Security/burglar alarm system, entrance door with video intercom facility and private swimming pool are included in the price. Provisions for central heating, air-conditioning and satellite reception are included in the price. Villa No19: Detached 3 Bedroom Villa consists of two floors. The ground floor includes living room, dining room, kitchen, guest’s WC, uncovered parking place, covered and uncovered verandas. The first floor has en-suite master bedroom with uncovered balcony, family bathroom, two bedrooms one of them with uncovered balcony. Security/burglar alarm system, entrance door with video intercom facility and private swimming pool are included in the price. Provisions for central heating, air-conditioning and satellite reception are included in the price. Villa No20: Detached 3 Bedroom Villa consists of two floors. The ground floor includes living room, dining room, kitchen, guest’s WC, uncovered parking place, covered and uncovered verandas. The first floor has en-suite master bedroom with uncovered balcony, family bathroom, two bedrooms one of them with uncovered balcony. Security/burglar alarm system, entrance door with video intercom facility and private swimming pool are included in the price. Provisions for central heating, air-conditioning and satellite reception are included in the price. parking place, covered and uncovered verandas. The first floor has en-suite master bedroom with uncovered balcony, family shower and one bedroom. Security/burglar alarm system, entrance door with video intercom facility and private swimming pool are included in the price. Provisions for central heating, air-conditioning and satellite reception are included in the price. Town House No23: Semi-detached 2 Bedroom town house consists of two floors. The ground floor includes living room, dining room, kitchen, guest’s WC, uncovered parking place, covered and uncovered verandas. The first floor has two bedrooms with uncovered balconies and family bathroom. Security/burglar alarm system, entrance door with video intercom facility and private swimming pool are included in the price. Provisions for central heating, air-conditioning and satellite reception are included in the price. Town House No24: Semi-detached 2 Bedroom town house consists of two floors. The ground floor includes living room, dining room, kitchen, guest’s WC, uncovered parking place, covered and uncovered verandas. The first floor has two bedrooms with uncovered balconies and family bathroom. Security/burglar alarm system, entrance door with video intercom facility and private swimming pool are included in the price. Provisions for central heating, air-conditioning and satellite reception are included in the price. Town House No25: Semi-detached 2 Bedroom town house consists of two floors. The ground floor includes living room, dining room, kitchen, guest’s WC, uncovered parking place, covered and uncovered verandas. The first floor has two bedrooms with uncovered balconies and family bathroom. Security/burglar alarm system, entrance door with video intercom facility and private swimming pool are included in the price. Provisions for central heating, air-conditioning and satellite reception are included in the price. Town House No26: Semi-detached 2 Bedroom town house consists of two floors. The ground floor includes living room, dining room, kitchen, guest’s WC, uncovered parking place, covered and uncovered verandas. The first floor has two bedrooms with uncovered balconies and family bathroom. Security/burglar alarm system, entrance door with video intercom facility and private swimming pool are included in the price. Provisions for central heating, air-conditioning and satellite reception are included in the price. Town House No27: Semi-detached 2 Bedroom town house consists of two floors. The ground floor includes living room, dining room, kitchen, guest’s WC, uncovered parking place, covered and uncovered verandas. The first floor has two bedrooms with uncovered balconies and family bathroom. Security/burglar alarm system, entrance door with video intercom facility and private swimming pool are included in the price. Provisions for central heating, air-conditioning and satellite reception are included in the price. Town House No28: Semi-detached 2 Bedroom town house consists of two floors. The ground floor includes living room, dining room, kitchen, guest’s WC, uncovered parking place, covered and uncovered verandas. The first floor has two bedrooms with uncovered balconies and family bathroom. Security/burglar alarm system, entrance door with video intercom facility and private swimming pool are included in the price. Provisions for central heating, air-conditioning and satellite reception are included in the price. Villa No29: Detached 3 Bedroom Villa consists of two floors. The ground floor includes living room, dining room, kitchen, guest’s WC, uncovered parking place, covered and uncovered verandas. The first floor has en-suite master bedroom with uncovered balcony, family bathroom and two bedrooms. Security/burglar alarm system, entrance door with video intercom facility and private swimming pool are included in the price. Provisions for central heating, air-conditioning and satellite reception are included in the price. Villa No30: Detached 3 Bedroom Villa consists of two floors. The ground floor includes living room, dining room, kitchen, guest’s WC, uncovered parking place, covered and uncovered verandas. The first floor has en-suite master bedroom with uncovered balcony, family bathroom and two bedrooms. Security/burglar alarm system, entrance door with video intercom facility and private swimming pool are included in the price. Provisions for central heating, air-conditioning and satellite reception are included in the price. Villa No31: Detached 3 Bedroom Villa consists of two floors. The ground floor includes living room, dining room, kitchen, guest’s WC, uncovered parking place, covered and uncovered verandas. The first floor has en-suite master bedroom, family bathroom, and two bedrooms, with uncovered balconies. Security/burglar alarm system, entrance door with video intercom facility and private swimming pool are included in the price. Provisions for central heating, air-conditioning, satellite reception and satellite reception are included in the price. House No32: Semi-detached 3 Bedroom Villa consists of two floors. The ground floor includes living room, dining room, kitchen, guest’s WC, uncovered parking place, covered and uncovered verandas. The first floor has en-suite master bedroom with uncovered balcony, family bathroom and two bedrooms, one of them with uncovered balcony. Security/burglar alarm system and entrance door with video intercom facility are included in the price. Provisions for central heating, air-conditioning and satellite reception are included in the price. House No33: Semi-detached 3 Bedroom Villa consists of two floors. The ground floor includes living room, dining room, kitchen, guest’s WC, uncovered parking place, covered and uncovered verandas. The first floor has en-suite master bedroom with uncovered balcony, family bathroom and two bedrooms, one of them with uncovered balcony. Security/burglar alarm system and entrance door with video intercom facility are included in the price. Provisions for central heating, air-conditioning and satellite reception are included in the price. House No34: Semi-detached 3 Bedroom Villa consists of two floors. The ground floor includes living room, dining room, kitchen, guest’s WC, uncovered parking place, covered and uncovered verandas. The first floor has en-suite master bedroom with uncovered balcony, family bathroom and two bedrooms, one of them with uncovered balcony. Security/burglar alarm system and entrance door with video intercom facility are included in the price. Provisions for central heating, air-conditioning and satellite reception are included in the price. House No35: Semi-detached 3 Bedroom Villa consists of two floors. The ground floor includes living room, dining room, kitchen, guest’s WC, uncovered parking place, covered and uncovered verandas. The first floor has en-suite master bedroom with uncovered balcony, family bathroom and two bedrooms, one of them with uncovered balcony. Security/burglar alarm system and entrance door with video intercom facility are included in the price. Provisions for central heating, air-conditioning and satellite reception are included in the price. Villa No36: Detached 3 Bedroom ‘’L’’ shape Villa consists of two floors. The ground floor includes living room, dining room, kitchen, guest’s WC, uncovered parking place, covered and uncovered verandas. The first floor has en-suite master bedroom with uncovered balconies, family bathroom, and two bedrooms. Security/burglar alarm system, entrance door with video intercom facility and private swimming pool are included in the price. Provisions for central heating, air-conditioning and satellite reception are included in the price. Villa No37: Detached 2 Bedroom Villa consists of two floors. The ground floor includes living room, dining room, kitchen, guest’s WC, uncovered parking place, covered and uncovered verandas. The first floor has en-suite two bedrooms with uncovered balconies. Security/burglar alarm system, entrance door with video intercom facility and private swimming pool are included in the price. Provisions for central heating, air-conditioning and satellite reception are included in the price. Villa No38: Detached 2 Bedroom Villa consists of two floors. The ground floor includes living room, dining room, kitchen, guest’s WC, uncovered parking place, covered and uncovered verandas. The first floor has en-suite two bedrooms with uncovered balconies. Security/burglar alarm system, entrance door with video intercom facility and private swimming pool are included in the price. Provisions for central heating, air-conditioning and satellite reception are included in the price. Villa No39: Detached 2 Bedroom Villa consists of two floors. The ground floor includes living room, dining room, kitchen, guest’s WC, uncovered parking place, covered and uncovered verandas. The first floor has en-suite two bedrooms with uncovered balconies. Security/burglar alarm system, entrance door with video intercom facility and private swimming pool are included in the price. Provisions for central heating, air-conditioning and satellite reception are included in the price. Villa No40: Detached 2 Bedroom Villa consists of two floors. The ground floor includes living room, dining room, kitchen, guest’s WC, uncovered parking place, covered and uncovered verandas. The first floor has en-suite two bedrooms with uncovered balconies. Security/burglar alarm system, entrance door with video intercom facility and private swimming pool are included in the price. Provisions for central heating, air-conditioning and satellite reception are included in the price. Villa No41: Detached 3 Bedroom Villa consists of two floors. The ground floor includes living room, dining room, kitchen, guest’s WC, en-suite bedroom, uncovered parking place, covered and uncovered verandas. The first floor has en-suite master bedroom with uncovered balcony, family shower and one bedroom. Security/burglar alarm system, entrance door with video intercom facility and private swimming pool are included in the price. Provisions for central heating, air-conditioning and satellite reception are included in the price. Villa No42: Detached 3 Bedroom Villa consists of two floors. The ground floor includes living room, dining room, kitchen, guest’s WC, en-suite bedroom, uncovered parking place, covered and uncovered verandas. The first floor has en-suite master bedroom with uncovered balcony, family shower and one bedroom. Security/burglar alarm system, entrance door with video intercom facility and private swimming pool are included in the price. Provisions for central heating, air-conditioning and satellite reception are included in the price. Villa No43: Detached 3 Bedroom Villa consists of two floors. The ground floor includes living room, dining room, kitchen, guest’s WC, uncovered parking place, covered and uncovered verandas. The first floor has en-suite master bedroom with uncovered balcony, family bathroom, two bedrooms one of them with uncovered balcony. Security/burglar alarm system, entrance door with video intercom facility and private swimming pool are included in the price. Provisions for central heating, air-conditioning and satellite reception are included in the price. Sporting and Health Center: The only covered sports centre in the area of Polis. 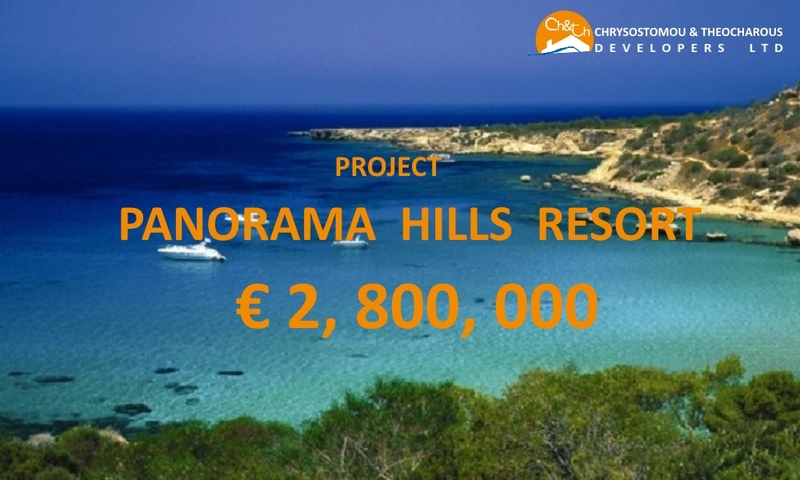 Situated at the Panorama Hills, with magnificent and unobstructed sea and Mountain Views. Part of the overall project, Panorama Hills offers its future residents all the facilities for gymnastics, swimming, relaxation, massage, sauna, beauty, the taste of traditional dishes, fruit and sweets in the little cafeteria that has a unique position in the overall project. It’s facilities will include a fully equipped Gym, heated covered swimming pool, changing rooms, a beauty salon, a hair dressing salon, a massage room, sauna, Jacuzzi, a cafeteria and mini market. A damp proof membrane course will be provided for all ground floor walls, foundation edges and verandas. Thermal isolation will be provided in concrete columns and beams. Walls will be decorated with ceramic tiles @ value of € 10.00/m² to door height and the remaining surface painted with three coats of emulsion paint. All other external doorframes will be in wood finish aluminum with clear double glazing. Provisions will be made for the option of adding fly screen nets to windows and sliding doors. All sanitary fittings and chrome-plated accessories will be highest quality of total purchase value € 1400.00 for each house. All installations will meet Electricity Authority of Cyprus’ (EAC) requirements and regulations. All residences will include a telecommunication and television installation. All plots will include perimeter fencing consisting of shingle on concrete wall and/or metal fence at a total height of 1.00 m above the proposed external finished floor level. Each residence’s frontal perimeter will be of average 0.80 m high reinforced concrete retaining wall. All roofs will be constructed of a reinforced concrete as per drawings and covered with French style red clay roof tiles. In order to ease the impact of the overall cost of the development it is proposed to carry out the construction in phases. There will be 7 (5+2) phases. Five blocks with each block housing 8 units, Services and Sporting Fitness Center. Each of the phases shall be planned to deliver units that are complete and ready for occupation. This will facilitate pre-selling of some of the units prior to the end of construction. This would be achieved through pro-active networking with property managers and estates officers in large corporations. The foregoing will result in further cushioning of the net effect of the cost of financing the project. 6. Construction of the sports center and parking around it. Our Company starting the design of this ambitious project in the village Meladia, Polis area a few years ago, intended to include the overall design of all amenities in order to provide the prospective user with all the facilities from the moment you decide to live permanently or temporarily at PANORAMA HILLS. The combination of permanent or temporary residence, holiday residence and work, is the only option in PANORAMA HILLS. Marketing of the properties is planned to start even before ground is broken for the start of the construction. 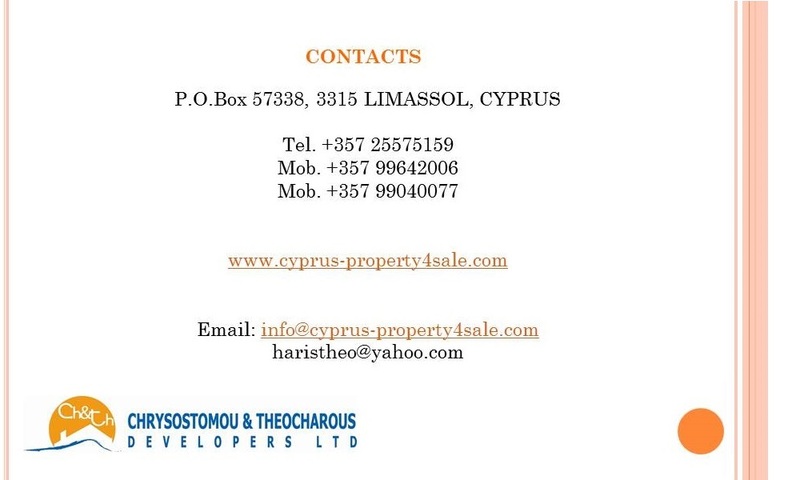 Our Company Chrysostomou & Theocharous Developers Ltd after many meetings with people involved in the property sector, real estate offices in Cyprus and abroad, participation in local as well as reports of property abroad, has achieved very powerful tools for sales. 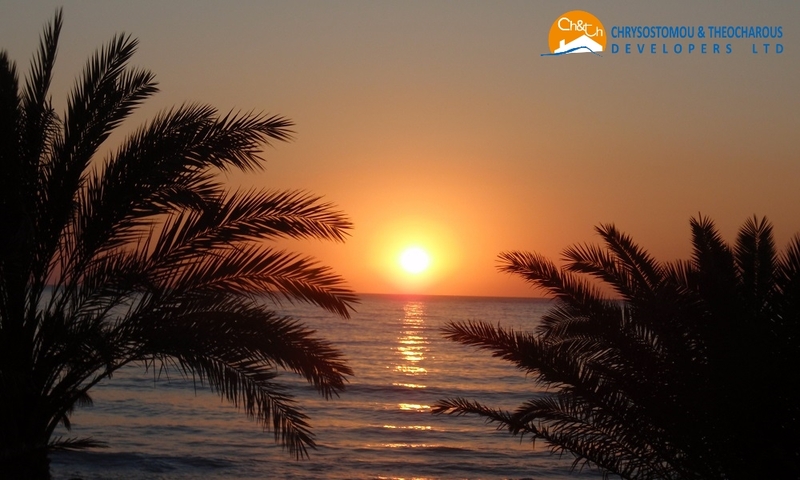 They also have co-operation agreements with real estate agencies with a working base in Cyprus, Russia and Kazakhstan. The sales department of our company, website, ads in magazines and newspapers, participation in fairs property, a very strong relationship with people who are interested in purchasing property in PANORAMA HILLS are other ways to help and objectives in relation to sales. A prospectus of the development will also be produced for distribution to potential purchasers. In order to provide a more tangible feel of the development, a show unit will be built from the start of the project. This will enable potential purchasers to appreciate the quality of the development. Investing in PANORAMA HILLS PROJECT will offer the opportunity to acquire a unique property and deliver value for your money. The project is located in an idyllic area with excellent amenities. 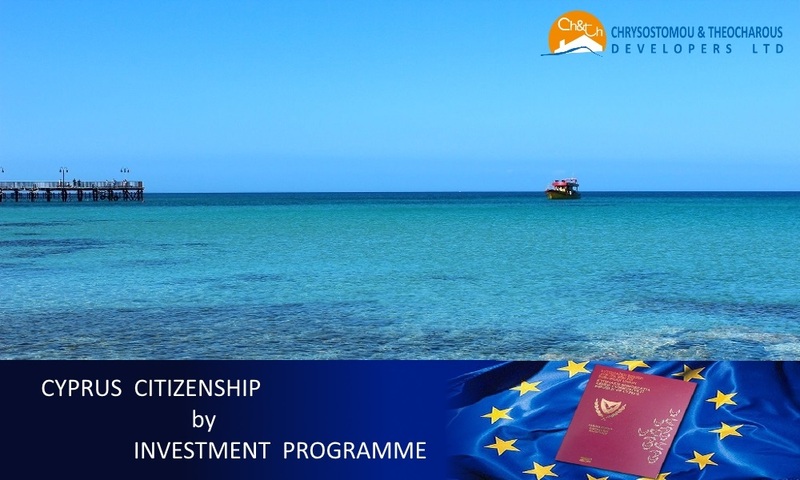 Anyone who would like to become investor with a specific percentage in this superb project, or a buyer interested in purchasing one or more residential units either as an investment or permanent/temporary residence, here is the unique opportunity.